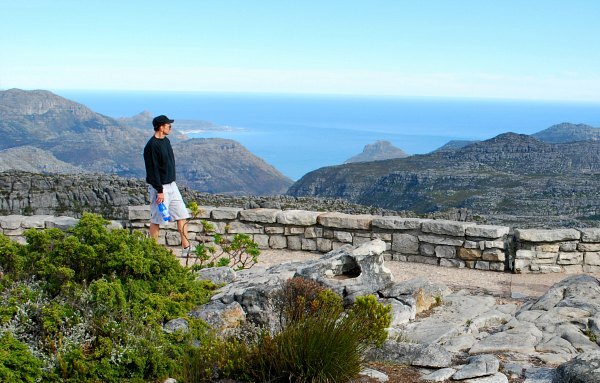 Table Mountain – Don’t miss the opportunity to get the most incredible view of Cape Town and learn about the natural habitat of this part of the Cape with a trip up Table Mountain. The floor of the cable car rotates during your brief ride to the top, which is a little disconcerting, but we liked it! There are lots of walkways around the top of the mountain along with plenty of viewing areas, a cafe and toilets etc. You really can spend hours up here if you want to, but a typical visit would be around an hour and we found it to be one of the most memorable moments of our trip. Just make sure the weather is good before you set out. V&A Waterfront – The harbour area in Cape Town has been transformed over recent decades and the run-down warehouses of the past have been turned into modern shopping and dining destinations. This area is now the undisputed leisure ‘hub’ of the city and there’s loads to see. 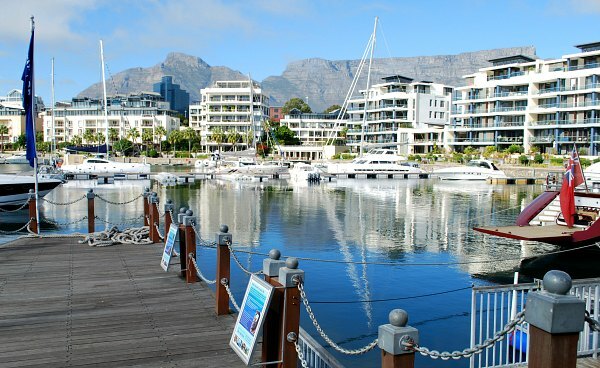 We just enjoyed strolling around and soaking up the view of Table Mountain as well as seeing the historic clock tower, but there’s also the huge Victoria Wharf shopping complex packed with stores, cafes and restaurants, the Two Oceans Aquarium, two further shopping arcades, the Marina and a craft warehouse. 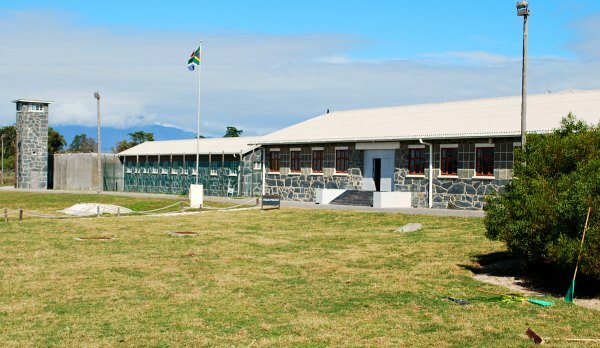 Robben Island – About 40 minutes by boat off the coast of Cape Town lies Robben Island, now infamous as the location of the prison which was used to hold Nelson Mandela and other political prisoners. Criminals were held here too, but the whole island is now a museum and hundreds of tourists visit every day, weather permitting. You get to see the whole island by coach, including the WW2 defences, before a tour of the prison which is led by a former political prisoner. In many ways this place was the catalyst for huge change in South Africa and a visit here will leave you in no doubt of the vital role it played. 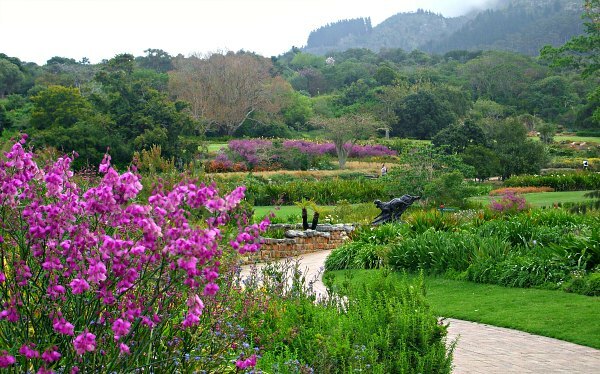 Kirstenbosch Gardens – It’s described as one of the best botanic gardens in the world and a visit to Kirstenbosch will not disappoint, especially at the right time of year. The garden sits on the slopes of Table Mountain and the unique climate here allows for very green, well watered gardens, nearly all year round. The plants and flowers of the Cape are the speciality here, but there’s lots more to see too. On a nice day, it’s lovely to spend some time on the pathways soaking up the sun and the amazing show of colours. 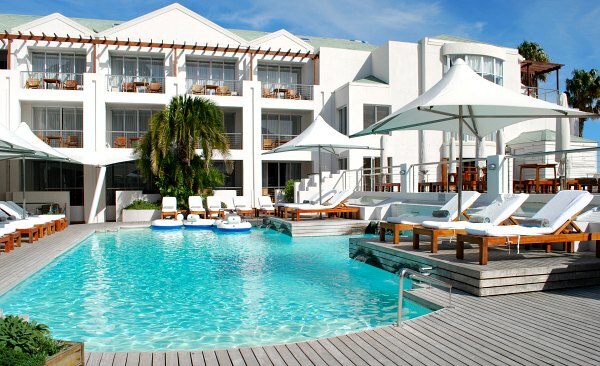 Camps Bay – Just over the hill from Cape Town is the seaside resort of Camps Bay with its beautiful beach and trendy restaurants. The houses in this part of the Cape are owned by the area’s most affluent people and they all sit in the shadow of a different perspective of table mountain. The craggy outcrops of the mountain here are known as the 12 apostles, even though there are more than 12 of them. 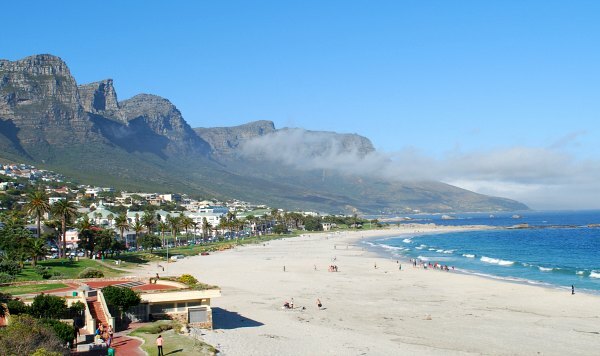 Camps Bay is a great option for a place to stay in Cape Town as it gives you the advantage of a seaside feel but retains easy access to the best bits of the city. 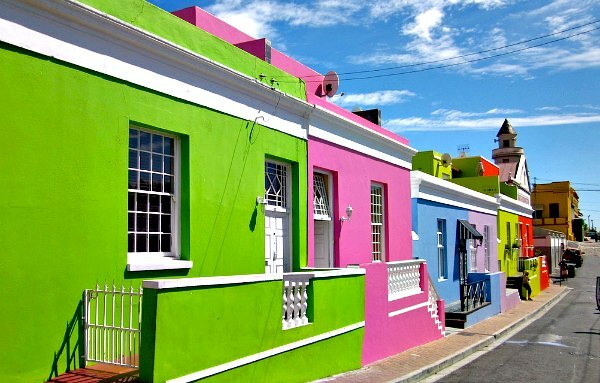 Bo-Kaap – This area, at the foot of Signal Hill, is Cape Town’s most colourful district. It used to be referred to as the Malay Quarter, because of the people who used to live here, but these days it’s known for it’s array of brightly coloured houses, set along lovely cobbled streets. We’d recommend a visit to the museum here which charts the history of the area and explains the origin of the bright colours. The theory is that they came about as a statement of freedom from slavery for the people who originally lived here. 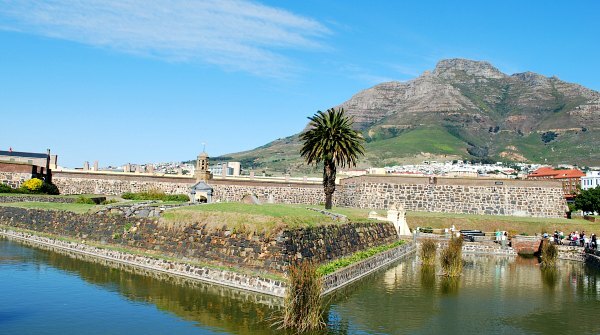 Castle of Good Hope – This fort was constructed by the Dutch East India Company (VOC) in the 1660s and is the oldest building in colonial South Africa. It was meant to be a fortified replenishment station for the many ships which arrived in port. These days it’s a military fort housing a military museum. If you like military history, you’ll probably enjoy the museum more than we did, but the building itself was the star for us. 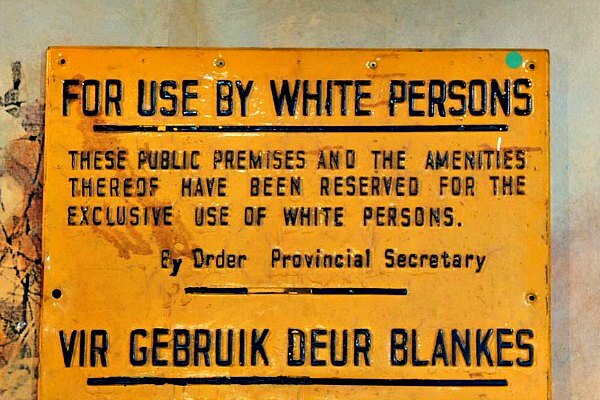 District 6 – This area of Cape Town was at the heart of the troubles of Apartheid. It used to be an area where people of all backgrounds lived, but when it was designated a white only area, many houses were torn down and their owners displaced. It became so controversial that, much of the area was left as grassland and to this day there is still much debate about whether it should be built on or whether it should stay as a reminder of the past. There’s a fascinating museum here which documents how the area was cleared. 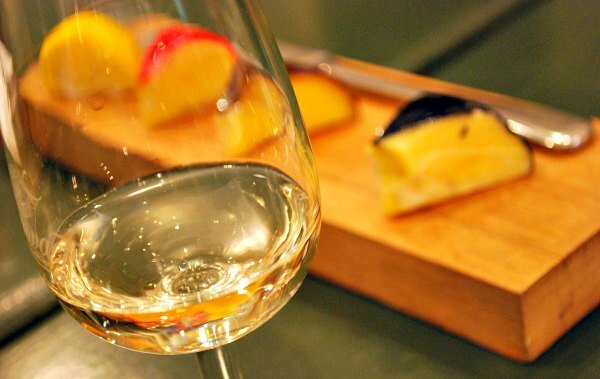 Wine Tours – The main wine growing areas of South Africa are just a short drive from Cape Town and if you love wine, you’ll enjoy a trip to the many wineries that open to the public. The main ones are located around the picturesque towns of Franschhoek and Stellenbosch which are both worth stopping in for a wander around the boutique shops. We chose to go on an organised wine tour from Cape Town so it didn’t matter how much wine we drank and it was a lovely experience. We stopped at several wineries and sampled dozens of wines. Boulders Beach – Just under an hour’s drive from Cape Town is one of the few places in the world where you can walk alongside wild penguins. 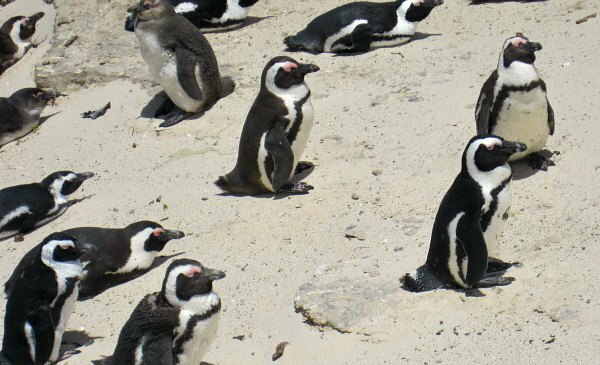 Back in the 1980s, a colony of African Penguins moved onto Boulders Beach and made it their home. The colony has grown since then and now the other regular visitors to the beach are tourists. Some board walks have been constructed on Foxy Beach to get visitors as close as possible to the birds without disturbing them. 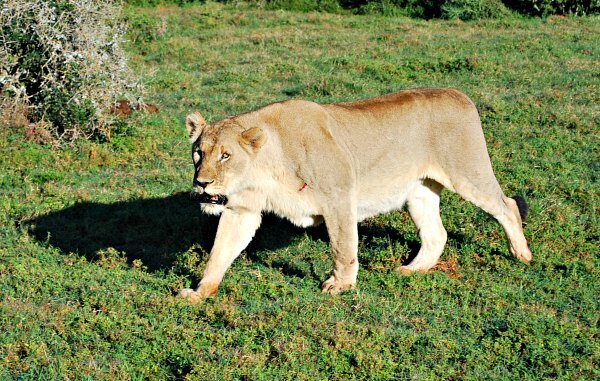 Safari – If you’re going to South Africa, then don’t miss out on a safari. For us, it was one of the most amazing experiences in our lives. There are places you can visit within driving distance of Cape Town, but not all safaris are the same. In some locations you won’t see all the animals you’d expect, in others the animals are fed, so it’s more like a zoo. After much research, we settled on a private game reserve which has luxury accommodation, all the animals you’d expect and all-inclusive “game drives” with experienced rangers. Shamwari Game Reserve, which is about 25,000 hectares in size, was absolutely fantastic and we’d recommend it to anyone. Other options include the official National Parks. There is clean, safe and reliable MyCITI bus service in Cape Town which serves the main routes in the city centre. Many people still choose to use taxis instead though, but be careful which kind of taxi you use! Ask your hotel to call you a metered cab and they should know which ones are reliable. You can then arrange for that same cab to take you back later. Alternatively use a big, well known company like UNICAB. We also used the Hop-on Hop-off Bus Tour to get to the major sights.